At the 1951 general election, Fianna Fail failed to regain their Dail majority and got back power only with the assistance of independents. The Fine Gael share of the national vote expanded almost by a third. No other Fine Gael taoiseach has ever done so well at the end of a period in office. However, history has not been kind to Costello, forgetting his general achievement and focusing on the maladroit manner in which he orchestrated Ireland’s departure from the Commonwealth in 1949 and his avowed subservience to Episcopal dictation in withdrawing the mother-and-child scheme proposed by minister for health Noel Browne. 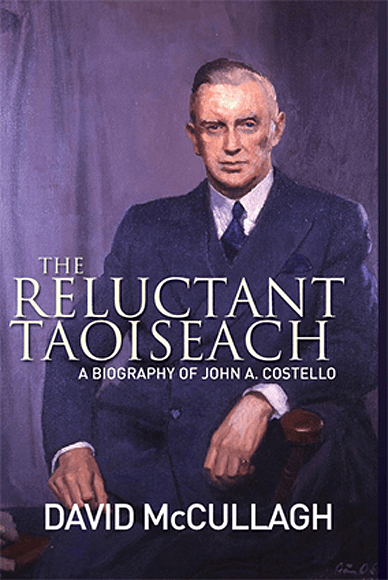 Review: The Reluctant Taoiseach: A biography of John A Costello by David McCullagh – Books, Entertainment – Independent.ie. For some more insight into Costello’s role as a barrister, you could do worse than read Pat Walsh’s excellent Patrick Kavanagh & The leader which shows him in the court room cross-examining the famous poet. Written by: Eoinpurcell on 1 November, 2010.